Having run a very frustrating 10k last Sunday in the British 10k, and spent pretty much all of the race not running as well as I knew I could and weaving in and out of lots of walkers, I decided to go for broke and do another 10k – on my local route – and go for it, the very next day. No this wouldn’t normally be do-able after running a good race and pushing yourself but no normal post race DOMS or anything even close this time. After all my other races – 1/2 and full marathons – I’ve not been able to walk or do stairs for a good few days, never mind run! 10k is shorter sure but you should still feel something, if not at least very very tired and in need of a rest. 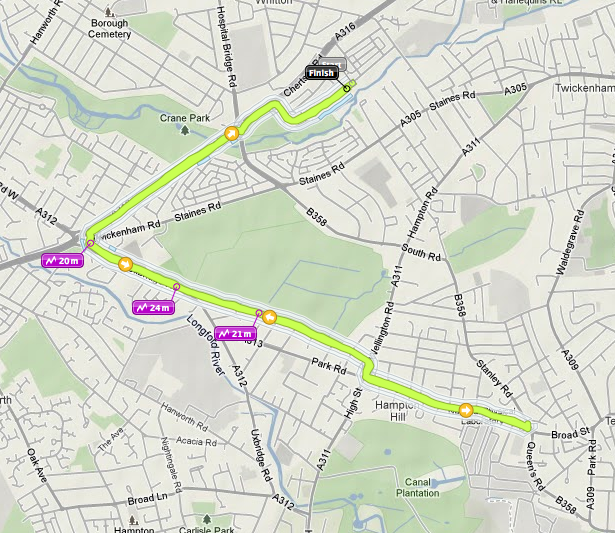 My local route is out 5km and back 5km with only a couple of roads to cross so no big issues being forced to drop pace. And avoiding the gate into Bushy Park – which saves a good 10 seconds in and out. I set off with a great pace – sub-7 minutes per mile and managed to maintain it until the dreaded turn around. It then dropped back to around 7:08 and hovered there until the last mile or so. Then I picked up a bit more and finished with a pace of 7 minutes per mile and time of 43 minutes and 30 seconds. A whole minute better than my recent PB on the same route and 3 minutes better than the British 10k the day before. Nice! It just shows how bad the race had been for me. This one felt good and sub-40 minutes by the end of the year is a possibility – with the right speed work! Some 5k Parkruns to be done next and at a new one at our local Crane Park – less than one mile away from us, so nice and easy to get to on a Saturday morning. This entry was posted in Running and tagged 10k, 5k, British 10k, Bushy Park, Crane Park, DOMS, Muscular soreness, Parkrun, PB, Running, Speed work, Sub-40 minutes on 16/07/2012 by Jason. As well as being able to spot me running a mile away now and glowing in the dark, they do feel much lighter and pretty comfortable. A 5km run today and 27 seconds faster than my most recent best time – just over 21 minutes. The 20 minute goal is within site once again! Obviously it’s back to speed work this week. 10 miles or interval training tomorrow – to be decided still – and then 1/2 marathon at the weekend. 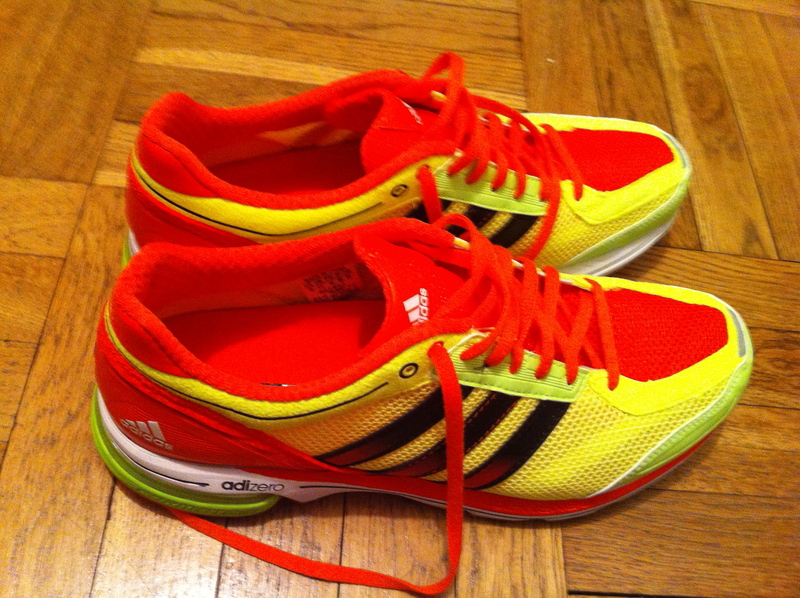 This entry was posted in Running and tagged 5km, 8mph, Adizero, Half marathon, Mobility scooter, Running, Speed work, Yellow shoes on 22/02/2012 by Jason.